Christmas just isn’t the same as being at home. This is normally the one time of year that I make the effort to spend with my family. Its strange being so far away. 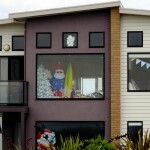 I’v kind of just been pretending that its hasn’t been Christmas at all. Its quite easy to do here. Its summer at the moment so Its lovely and sunny. After spending the morning opening our delightful Christmas presents (lovingly brought in the Reject shop), eating our Gingerbread Shack and dreading cooking dinner in the tiny oven, we made our way to the beach. We played on the body boards and splashed about in the sea for a couple of hours, then finished off the morning off with some sandcastles. Beautiful! We were all quite tired after a the past few days of activities. We had been to see the Penguin Parade where the local little penguins return from a days fishing and waddle back up the beach to their hungry chicks. 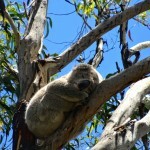 Visited a Koala sanctuary and a farm and been on some lovely walks. Me and Bob also got addicted to Maddy’s favourite card game, Monopoly Deal. I must get this when I go home. 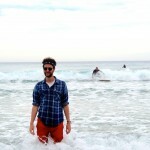 On Christmas eve we went to Wilsons Prom, a national park and Austrailia’s most southernly tip. 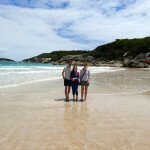 This is where my favourite beach of all time is, Squeaky Beach. 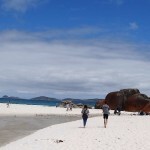 Its called Squeaky Beach as the sand has such a high silicon content that it makes a squeak when you walk on it. 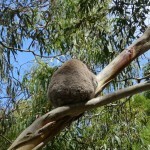 They have lots of wildlife here including Wombats so I was really excited. 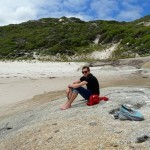 Unfortunately we didn’t see one, but we did get quite close to some beautiful Kangaroos. 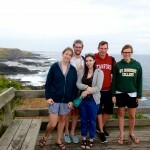 Tomorrow we are leaving Philip Island, saying goodbye to Andrew and heading up to Sydney where we will spend New Year.